I hauled a mustang about 2 months ago. Lady got stuck in her own yard, used her swaybar to drag her car out she locked the keys inside the car so I hauled it in park. Sometimes trying to help out puts you in a bind. She wanted to stay high and dry while I crawled under the car. 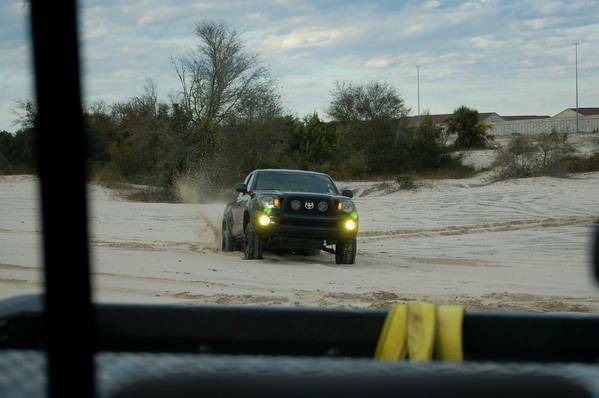 i have yet to come across anyone to pull out with my taco, but when i do i will take pics/vids for sure. blackwatertaco If you ain't stuck, You ain't tryin hard enough. 08 taco, 4x4 2.7 5spd. Taco - saving Taco from this weekends meet! Check out the link. looks like you guys had a blast. nice pics! I had a guy come up to me two months ago asking me to pull out his F150. I follow his bosses truck back to where the F150 is. the front end is completely sunk in the mud in a small ditch, the rear end is fully flexed and partially on some logs or something, and the pumpkin looks like its hung up on something. Tried to get me to use a ratchet strap for moving furniture to pull him out. I ended up leaving after using an actual tow strap to get him out but couldn't get him to budge. wonder if he ever got out. ^^^ Oh no. They are using a chain. thanks man, but i hasn't taken off like i thought it would, oh well. as for the chain, im suprised it didnt break on that first tug myself. I eventually pulled him out. Sorry no shots during the pull. I was concentrating on other things. Something tells me that those super duties aren't the best for the sand.